This entry was posted in Uncategorized and tagged DIY Musician, Independent Musician, Jazz, Music distribution by nickhemptonband. Bookmark the permalink. I’ll read everything you write, and your suggestion of writing about gigs, venues, musicians etc sounds interesting. Jazz on! So the horse is not entirely dead – good to hear! I also read everything that you write. 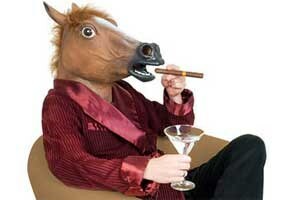 Say, would the horse’s smoking jacket fit me? ?